These homemade lacy snowflakes are easy to make for Christmas, in the same way as our Circle of Lace ornaments. 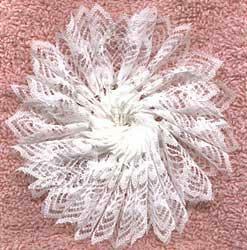 For the snowflake design, however, it is is best to use lace with a scalloped edge, preferably a scallop with sharply defined points to provide the lacy snowflake effect. The amount of lace that you need will depend on the amount of fullness desired, and the weight of the lace being worked. I used about 20 inches of lace for this snowflake. Feed the lace onto a piece of wire as close to the bottom edge of your lace as possible, while keeping the lace secure to the wire. Either feed the lace through the lace, or weave it back and forth, depending on what works best for the lace you’re are using. Pull the lace together tightly in a ring, then twist the ends of the wire together to secure the snowflake. Cut any excess wire. That’s really all there is to making these beautiful snowflakes! They look quite stunning on their own, or as part of a snow-theme Christmas tree.